Argent, on a pale wavy between two Latin crosses formy swallowtailed azure a sea-unicorn argent. 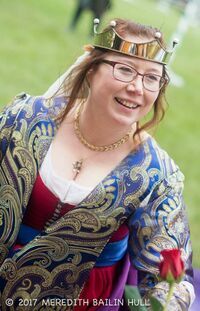 Her Excellency Vienna began her SCA tenure during Pennsic 25, and attended a few Pennsics and Birkas before volunteering for a Royal Household. The Reign of Andreas I and Isabella I was instrumental in immersing Vienna in the SCA. Prior to that time, she didn't sew, her embroidery consisted of cross stitch Christmas ornaments exclusively, and she lived in the Bog at Pennsic. It was also during their Graces' first reign that she met Wilhelm von Ostenbrucke. Residing in the Barony of Dragonship Haven, in the East Kingdom, Vienna de la Mer was apprenticed to Duchess Roxane Farabi. Her main focus is Embroidery; however, she's also interested in Gardening, Folklore, Cooking, Herbology, Helping Newcomers, Sewing/Costuming, Thrown Weapons, Beekeeping, and Archery. Vienna is currently the Guildmistress of the Keepers of Athena's Thimble, the East Kingdom Embroiderer's Guild. Youngest daughter of a Genoese shipping merchant and French midwife, Vienna was given to a noblewoman, along with her nieces, to serve as Ladies In Waiting at Court. This noblewoman later became Queen. Once upon a time, at a 12th Night celebration, Vienna and Wilhelm met – he, a Squire to the King; she, a Lady-in-Waiting to the Queen. The rest is… history. Main Persona: Late 15th century Italian/French. Alternate Personas: 14th century English or 10th century Norse (Heiðabýr). 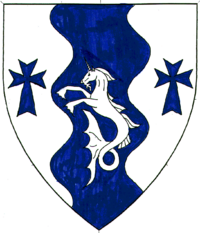 Personal Device: Argent, on a pale wavy between two Latin crosses formy swallowtailed azure a sea-unicorn argent. Personal Badge: (Fieldless) A sea-monkey vert. Wife of Wilhelm von Ostenbrucke. She also has a mild allergy to MUSHROOMS.